I think I’ve mentioned making pumpkin pie oatmeal several times over the last year or so, and every time I have a bunch of people practically beg for the recipe. So why has it taken me so long to post this recipe? I wish I had a good excuse, like that the dog ate my blog post or aliens invaded my town and stole all the oatmeal, but we would all know that’s a lie. My dog doesn’t like eating and aliens hate oatmeal. To make it worse, this recipe is not fancy or complicated at all. You don’t need to use your oven or pots. In fact, you don’t even need to make a trip to the grocery store to buy an expensive specialty ingredient that you’ll only use once before it languishes in the back of your pantry. Measure all of the ingredients into a microwave-safe bowl and stir just until combined. Microwave on high for 1-2 minutes, or until desired consistency. Top with more pecans and dried cranberries, if desired. Serve immediately. You’re just using regular rolled oats here, right? I am so quadrupling this and making it for my family tomorrow morning — thanks! I like to use “old fashioned” oats because I like lots of texture in my oatmeal, but you can use the “quick cooking” kind too! The only kind of oats that probably won’t work are steel-cut oats. Yum! You just had to post this the same day that I run out of oatmeal, didn’t you? :) I think I will have to make a trip to the grocery store tonight just so I can make this in the morning. I am just LOVING your blog! Maybe its because I’m pregnant, or maybe its just because I have a sweet tooth, but you definitely know how to get my cravings going! Theresa, this looks scrumptious! I’m going to have to try this out for breakfast very soon. 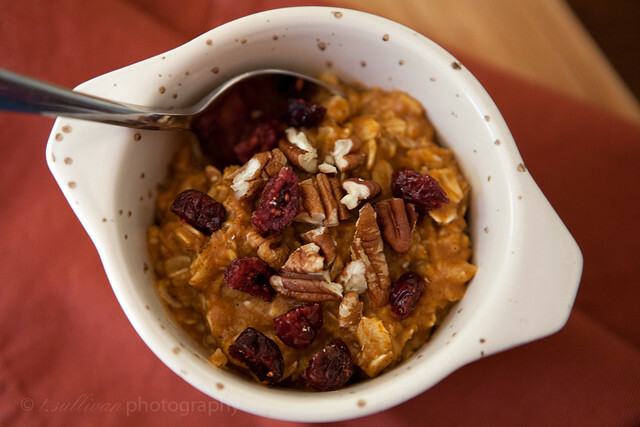 I LOVE dried cranberries and pecans with pumpkin! This looks wonderful. Love oatmeal. Love pumpkin. Match made in heaven. How about dog ate the oatmeal and aliens took over your blog!!!!! Forgiven and forgotten. I’m not the type to hold a grudge. Especially not when it comes to pumpkin pie oatmeal. That stuff’s way too good for grudges. So glad you guys liked it Cheri! It is perfect for using up extra pumpkin, which I always seem to have in the Fall. This is a perfect breakfast material, and i am betting it tastes faboush. i love brown sugar. thanks for sharing! Oh yay, I’ve been wanting to make pumpkin oats for the longest time but was afraid of messing up—this is a great basic recipe to build upon. It looks delicious and can’t be any easier, eh? Wow, this is much simpler than the recipe I tried on my blog! I will definitely be trying your version! I made this for my family a while back and wrote about it on my blog here. My husband and daughter thought it was awesome. Thank you for sharing your recipe!